The CNP-TEPC is the main differentiator in the NEUDOSE mission from other CubeSat projects. The instrument reacts differently in ionizing vs non-ionizing radiation. It does this with a combination of the 2 cooperating technologies. The Spherical TEPC (pictured below), which is filled with enriched propane gas to model a human cell , is fabricated using the most recent techniques developed by NASA. It has a wall made of electrically conductive tissue-equivalent plastic. When this instrument reacts with radiation, an electrical current is triggered through the anode wire sticking out of the poles. If at the same time a reaction occurs in the surrounding Anti-Coincidence Detector (ACD), we will know that we have received charged radiation. If we do not, then it is simply just neutral or non-ionizing radiation. 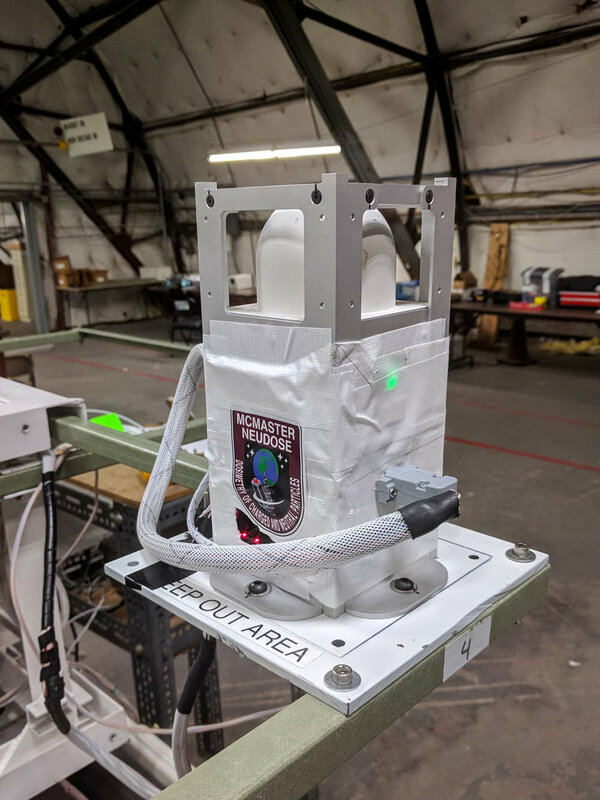 The CNP-TEPC is the primary science payload and is currently being designed to be small enough so it can also potentially fit on the Extravehicular backpack carried by astronauts during spacewalks. On February 13, NASA had declared the Opportunity rover had officially ceased communication. Opportunity was deployed in 2003 and was anticipated to operate for 90 days, but has remained functional for a record 15 years. Opportunity’s mission was to analyze Martian soil for traces of water, of which it has confirmed is present. The mission results validate and encourage our desire to explore the red planet. Our NEUDOSE mission seeks to ensure that humanity will be able to perform safer space travel, with a more advanced knowledge of the effects of solar radiation on humans outside our Earth’s protective magnetosphere. Our CNP-TEPC (Charged and Neutral Particle - Tissue Equivalent Proportional Counter) instrument allows us to distinguish between ionized and non-ionized radiation and to estimate doses received during space travel. Tonight, the Total Lunar Eclipse will be visible in Hamilton. A lunar eclipse, when the Earth casts a shadow on the moon, is quite a rare event and Totality will not be visible in Hamilton again until May 2022. The moon turns a red colour once the Earth fully blocks the sun. Similar to the ring we see during an annular solar eclipse, the moon sees a bright red ring around the Earth. This ring is red due to the contents of our atmosphere. Volcanic activity is also capable of influencing the appearance of the moon during an eclipse and can make it significantly darker. For more information and a live animation of tonight’s total lunar eclipse, visit this link. As the year begins to draw to an end, we reflect on our progress and challenges overcome throughout the year. 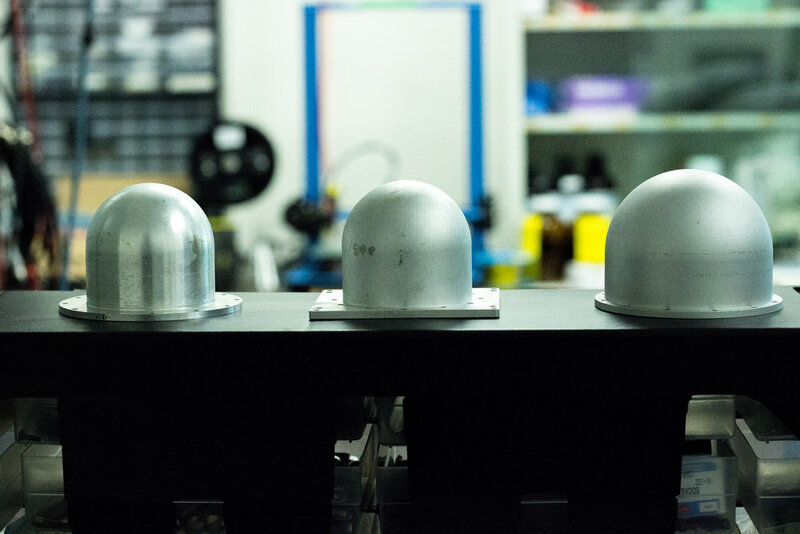 One example of progress in our NEUDOSE mission is in our Pressure Vessel Enclosure, designed by our Mechanical team. The picture above shows the design iterations (in order from left to right). As the project progressed, certain parameters continued to change/develop. Some of these design constraints include: Space requirements, strength of the material, load capabilities, and ease of integration. Our experienced team adapted to these changes and proceeded to apply their skills and knowledge, refined at school here at McMaster University, to the design changes. Fun Fact: Theoretically, a sphere is the optimal shape of a pressure vessel due to the even stress distribution. However, due to the difficulty and cost of manufacturing a perfect sphere, often cylinders with rounded ends are used. Join us at McMaster Fall Preview tomorrow! On Saturday, November 17th, find us at the Gerald Hatch centre between 10am - 3pm to learn more about our team and our mission! Today, we would like to thank our sponsors for the generosity and support through the last few years to get us flying! Your assistance has very much appreciated. Soldering is the fundamental process that allows for the creation of structural and electrical bonds between two separate objects. It is necessary for the fabrication of most microelectronics; from computers to cellphones, and even to satellites! But what happens when we send these soldered electronics to the vacuum of space? Find out at our second General Lecture! Monday October 1st, at McMaster University’s Chester New Hall (CNH) 103 @ 6:30 pm. On Monday, September 17, we hosted our first General Lecture. We were able to introduce our mission and team to the students of McMaster who have shown interest in joining the project. With recruitment around the corner, we wanted to showcase the different subteams to provide applicants with a clearer image of what is expected in each team.